Pygmy Hippopotamuses are semi-aquatic mammals. They have a body length between 1.4 and 1.6 m (4.5 - 5 ft), a tail length of approximately 15 cms (6 inches) and they weigh between 245 and 275 kgs (540 - 610 lbs). Their skin is thick, smooth, hairless and dark brown/black in colour. Their body is barrel shaped, they have a broad head and a large mouth. Their legs are short and stocky and they have four toes on each of their feet. Their toes are spread out and have sharp nails, but they lack any webbing. They have small ears and large, round nostrils and when they submerge underwater they are able to close their nostrils and ears to prevent water from entering them. To prevent their skin from cracking they have to moisten it regularly in water or mud and they also have special mucus producing skin glands. These glands excrete a pink fluid, known as blood sweat, that helps to keep their skin moist and helps prevent against infection and sunburn. 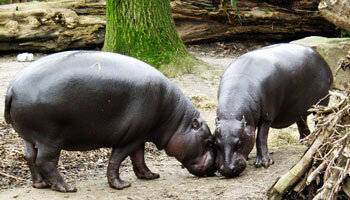 Pygmy Hippos are found in the forests and swamps of west Africa. They are solitary, reclusive animals that spend most of the day resting in a wallow, mud or river and they emerge at night when they go into the forest to feed. They are non territorial and females have a home range between 40 and 60 hectares whereas males have a larger home range being up to 165 hectares in size. The home ranges of both males and females overlap but they tend to avoid each other, marking their presence with dung. The diet of a Pygmy Hippopotamus mainly consists of shrubs, ferns, broad-leaved plants and fruit. Pygmy Hippos mate and give birth either on land or in the water and after a gestation period of 196 - 210 days, 1 well developed calf is born. At birth the calf weighs between 4.5 and 6.2 kgs (9.9 - 13.7 lbs) and they can swim almost immediately. They stay hidden from predators for approximately 3 weeks and during this time the female goes and feeds them 2 - 3 times in a 24 hour period. 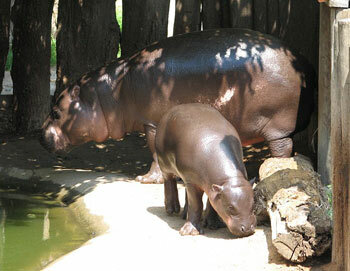 The calf is weaned when it is 6 - 8 months old and Pygmy Hippos reach sexual maturity at 4 - 5 years of age. Humans and Leopards are the main threat to adult Pygmy Hippos but young Pygmy Hippos can be attacked by pythons and crocodiles. The name Hippopotamus comes from the ancient greek meaning "river horse"
Hippopotamus is often shortened to Hippo. Hippopotami is also accepted as the plural for Hippopotamus. 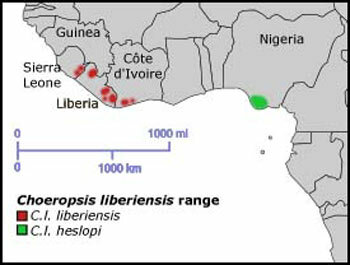 The Pygmy Hippopotamus sometimes has the scientific name Choeropisi liberiensis. The Pygmy Hippopotamus has been included as one of the 10 species to be investigated by the Zoological Society of London Edge of Existence Programme in 2007. The Pygmy Hippopotamus is one of only two extant species in the hippopotamidae family, the other being the much larger hippopotamus.